Here are the specific photos and instructions to make the beautiful snow globe cupcakes that I made for my daughter’s 4th birthday party. I found these cute little cupcakes in the fun cupcake book, Hello, Cupcake! These cupcakes were so much fun to research and create, and the kids had a fabulous time eating them! I had so much fun putting these together and Katelyn was so excited when she saw them all completed. 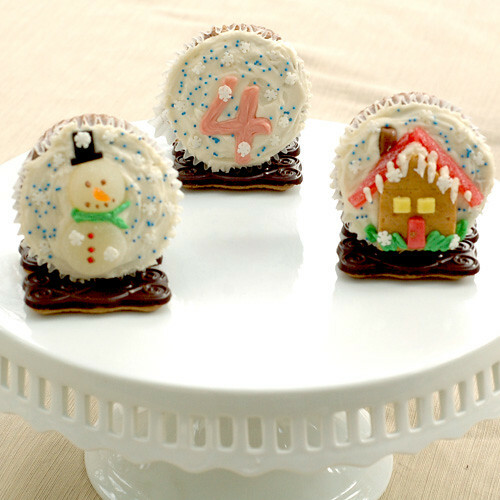 You will be a hit at any holiday party with these super cute cupcakes! Tint ½ cup of the vanilla frosting green with green food coloring and spoon it into a Ziploc bag. Spoon 2 tablespoons of the vanilla frosting into a small Ziploc bag. Spoon the chocolate frosting into a Ziploc bag. Press out the excess air in the bags of frosting and seal. Spread the remaining vanilla frosting on the top of the cupcakes and smooth. 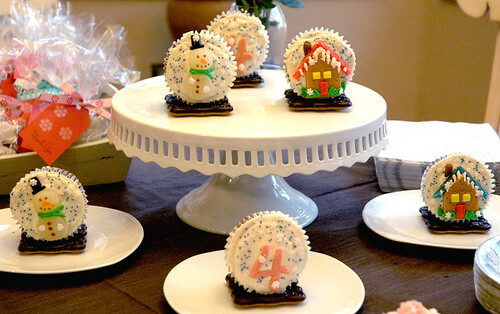 Sprinkle the top of the cupcakes with some of the snowflake sprinkles and the blue nonpareils. Using a serrated knife, cut out 2 house shapes out of the graham cracker. Press the house crackers into the frosting on 2 of the cupcakes, with the peak toward the center and the flat side at the edge of the cupcake. Cut the red sour straw into 4 segments 2 ½ inch lengths for the roof and place 2 pieces along the roofline of each graham cracker house, allowing the straws to overhang slightly on each side. Roll out the Starburst fruit chews on a sheet of wax paper to ⅛ inch thick. Cut the fruit chews into four ¼ inch squares for the windows and ½ by ⅓ inch rectangles for the doors. Cut 2 small chimneys from the Tootsie Roll candy and add one to each roof. Snip a ⅛ inch corner from the bags with the vanilla, green and chocolate frosting. Pipe 3 small dots on each house and attach the windows and doors. Using the green frosting, pipe bushes at the edge of the house. Using a squeeze and pull technique, pipe vanilla frosting icicles along the bottom of the roof. Add a dot of chocolate frosting for the doorknob. 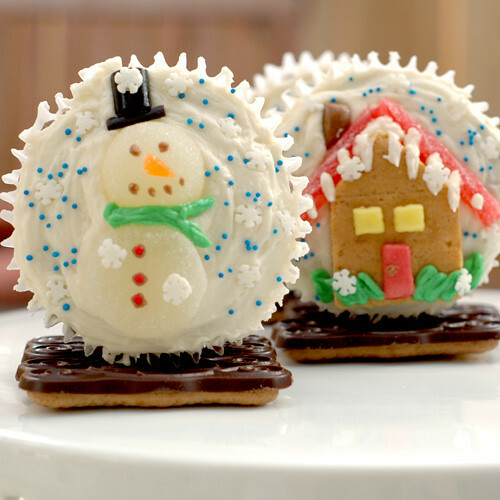 Add several dots of vanilla frosting to the house and press a few snowflake sprinkles into the frosting. Cut each white spice drop in half crosswise. Roll out the bottom half to make a disk that is slightly larger in diameter than the top half. 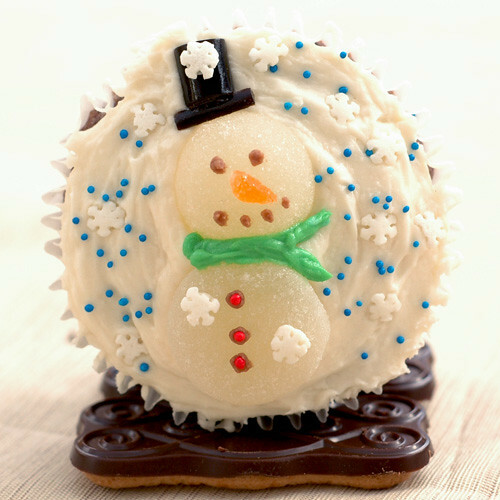 For the body of each snowman, press the flattened disk at the bottom edge of the cupcake, cut side down. Place the top half of the spice drop, cut side down, above the disk to make the head. Cut the orange spice drop into 2 small triangle noses and attach 1 to each head with a small dot of vanilla frosting. Trim each licorice candy into a ½ square to make the hat. Cut two ¾ inch pieces of licorice lace (or the other 2 licorice candies) for the hat brims and press 1 into the fro above the head on each cupcake. Add a square of licorice to make the hat. Pipe a green frosting scarf across the neck, where the head touches the body. Using the chocolate frosting, pipe eyes, a mouth and 3 buttons down the middle of the snowman. 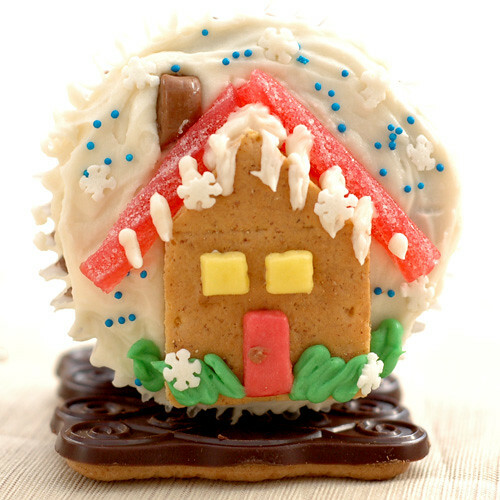 Add a few dots of the vanilla frosting to the house and press a few snowflake sprinkles into the frosting. Cut the Tootsie Roll candy into two ½ by 1 inch pieces. Press 1 piece into the frosting at the bottom edge of each cupcake for the tree trunk. To make the tree, pipe a 1 ½ inch wide row of vertical lines of green frosting across the top of the tree trunk, squeezing and pulling each line into a long downward point. Pipe the next row above and overlapping the first. Continue piping in this way, each row smaller than the last, to make a tree shape. Sprinkle a few snowflake sprinkles and nonpareils on the tree. Top each tree with a yellow star candy. When I asked my daughter what kind of cupcake she wanted for her birthday she immediately said “strawberry” then VERY quickly she changed her mind to blueberry and that is all she wanted after she came up with that idea! I was thinking blueberry? I had never heard of blueberry cupcakes, but I knew my foodie bloggers would not let me down, so thanks to Food Gawker, I found this fabulous recipe! I used these for the snow globe cupcakes that I made for my daughters party, but I managed to save a few extra for us to enjoy. 🙂 These cupcakes were absolutely delicious! The cake was perfectly sweet with a subtle blueberry flavor. 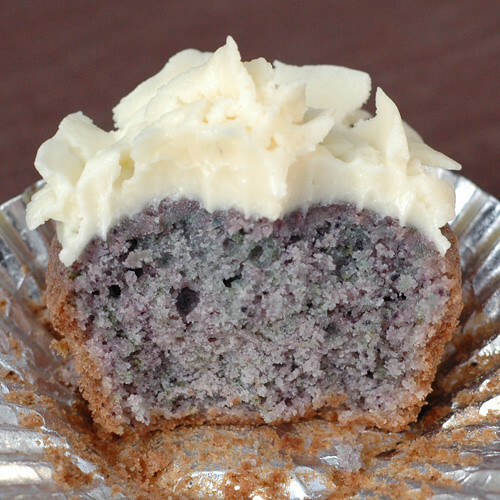 The blueberry is pureed so the cupcakes are a very beautiful purplish blue color, which was fun for the kids. This buttercream frosting is out of this world delicious! This will now be my go to buttercream for future cupcake recipes! extra smooth puree pass mixture through a fine sieve before using, but I didn’t do this and it was fine. Makes about 1 1/4 cups. Cream butter and sugar until pale and fluffy. Add one egg at a time, beating until incorporated after each one. Sift dry ingredients into a separate bowl. Mix milk with 1/2 cup of blueberry puree and vanilla. Add wet and dry ingredients alternately to butter/sugar mixture starting and ending with the dry ingredients in three additions. Mix until just incorporated after each addition. Do not over beat batter. The batter will puff up when baking, but then settle again once it cools, so you want to make sure that you fill each liner at least 3/4 full of batter. 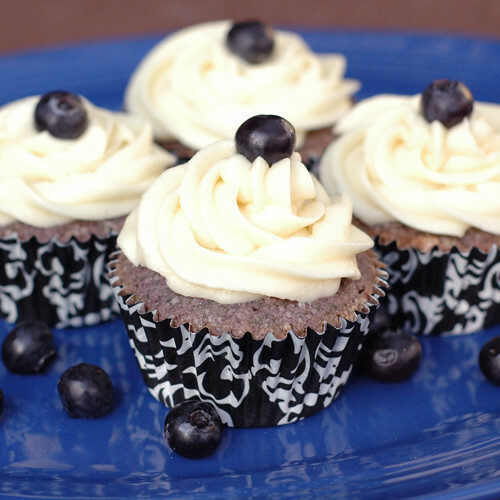 If you want an extra punch of flavor you can mix in a little of the blueberry puree into each cupcake and swirl slightly with a wooden skewer or small spoon. Bake for 18 to 20 minutes or until cake springs back to the touch. Cool for 10-15 minutes in the pan then turn out onto a wire rack and cool completely before frosting. In a stand mixer fitted with the whisk attachment, beat butter at medium-high speed until smooth, about 20 seconds. Add confectioners’ sugar and salt; beat at medium-low speed until most of the sugar is moistened, about 45 seconds. Scrape down the bowl and beat at medium speed until mixture is fully combined, about 15 seconds. Scrape bowl, add vanilla and heavy cream, and beat at medium speed until incorporated, about 10 seconds. Then increase the speed to medium-high and beat until light and fluffy, about 4 minutes, scraping down bowl once or twice. I am not one for dried fruit or nuts in my cookies, however I could not stop eating these cookies! These cookies are absolutely fantastic!!! 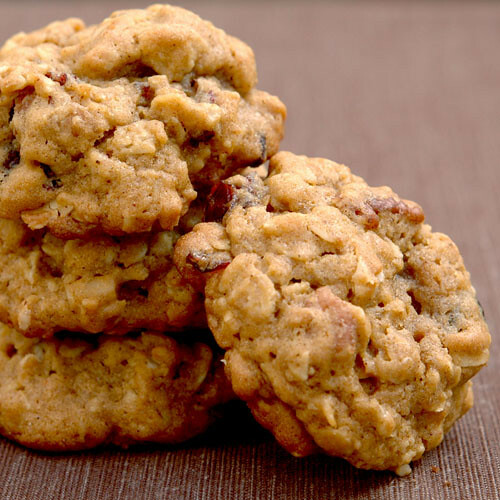 They have a wonderful blend of flavors with all the spices, molasses, sweet cranberries and nutty crunchy pecans. They have a gingerbread like flavor (I love gingerbread and molasses cookies!) with the texture of an oatmeal cookie. 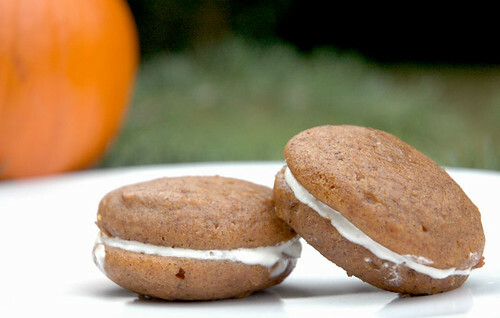 These are the perfect cookie for the fall holiday season. This recipe is easily adaptable to fit your personal fruit, nut or chocolate preferences. 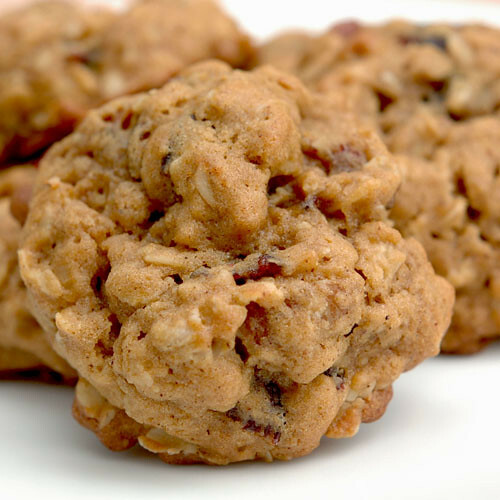 I think these would be great with some walnuts and mini chocolate chips…I just might have to try that combination very soon! So grab a big glass of milk or hot steamy cup of coffee (that is my favorite way to eat them) and enjoy these super delicious cookies! Preheat an oven to 375°F. Lightly grease 2 baking sheets or line them with parchment paper. In a bowl, sift together the flour, baking powder, baking soda, salt, cinnamon, nutmeg and allspice; set aside. In a large bowl, using an electric mixer, beat the butter on high speed until fluffy and pale yellow. Add the brown sugar and granulated sugar and continue beating until the mixture is no longer gritty when rubbed between your finger and thumb. Reduce the speed to low and add the eggs one at a time, beating well after each addition. Beat in the molasses and vanilla. Add the flour mixture and beat on low speed or stir with a wooden spoon just until blended. Beat or stir in the oats, dates and walnuts just until evenly distributed. Drop the batter by rounded tablespoons onto the prepared pans, spacing the cookies about 2 inches apart. Bake the cookies until the edges are golden, 10 to 12 minutes. Sprinkle the cookies with coarse sugar while they are still warm. Let the cookies cool on the pans on wire racks for 10 minutes, then transfer them to the racks and let cool completely. Makes about 4 dozen cookies. I just told you about my insane love for cinnamon last week, so you have to know that I have been dying to make this ice cream since I first saw the recipe this summer. I would have made it sooner, but I thought it would be a perfect flavor for the fall holiday season. This is another fabulous recipe from the book The Perfect Scoop. Like all the recipes I have tried from this book, it has the perfect texture. This ice cream is so rich and creamy and has a wonderful warm cinnamon flavor. The original recipe does not call for any ground cinnamon, and I did not add it for the flavor, I just wanted to be able to see the little flecks of cinnamon throughout the ice cream. 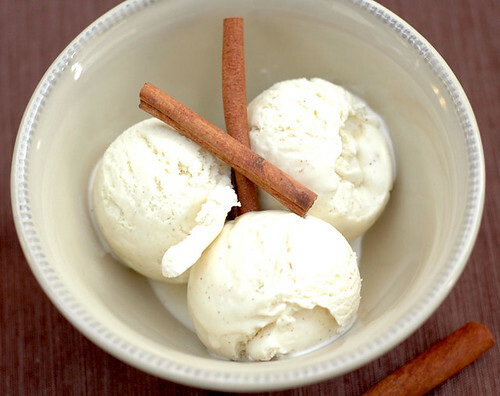 If you are like me and love all things cinnamon, you will love this ice cream. It would be perfect sandwiched between many different types of cookies for some very tasty ice cream sandwiches. It also would be the perfect ‘a la mode’ to any pie on your holiday table this year. Scoop. Dish. Enjoy! Warm the milk, sugar, salt, cinnamon sticks and 1 cup of the cream on a medium saucepan. Once warm, cover and remove from heat, and let steep at room temperature for 1 hour. Rewarm the cinnamon infused milk mixture. Remove the cinnamon sticks with a slotted spoon and discard them. Pour the remaining 1 cup cream into a large bowl, whisk in the ground cinnamon (optional) and set a mesh strainer on top. In a separate medium bowl, whisk together the egg yolks. Slowly pour the warm mixture into the egg yolks, whisking constantly, then scrape the warmed egg yolks back into the saucepan. Stir the mixture constantly over medium heat with a heatproof spatula, scraping the bottom as your stir, until the mixture thickens and coats the spatula. Pour the custard through the strainer and into the cream. Stir until cool over an ice bath. Chill the mixture thoroughly in the refrigerator, then freeze it in your ice cream maker according to the manufacturer’s instructions. Halloween is almost here and I couldn’t resist making something fun and cute for the Halloween season. These cute little pops are made with your typical Oreo like sandwhich cookie (I used Joe Joes from Trader Joes beacuse I love all things Trader Joe’s!) dipped in white candy melts and decorated. I usually make Halloween cut out sugar cookies with my daughter and let her decorate them with sprinkles, but this year I thought I would try something new. These were a little hard for Katelyn to help with, but I gave her the task of sorting out the eyes and grouping them by color. Now though the task was easy, it was VERY hard for her to resist eating the whole bowl of mini M&M’s, I mean they are her favorite candy ever! These were a lot of fun to make and making them helped me practice my piping skills (I definitely could use the practice in this arena). 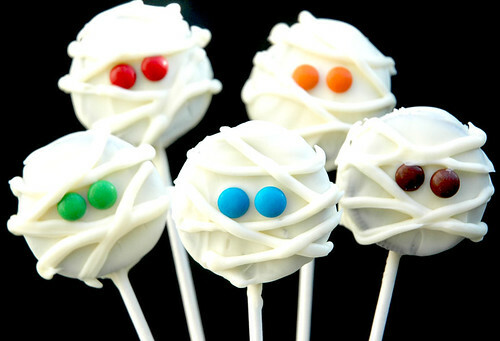 I am taking them to our 3rd annual family Halloween party on Saturday and they are sure to be hit! I hope you all have a spooktacular Halloween this year! Carefully separate Oreo cookies so you have one side with filling and one without. Melt 1 pound of white chocolate according to package directions. Dip the end of a sucker stick into the melted chocolate. Gently press the chocolate coated stick into the center of the Oreo filling. Carefully put the cookie back together. Repeat with remaining Oreos. Dip the cookie sucker into the melted chocolate to coat completely. Place on a wax paper lined cookie sheet. While the chocolate is still soft, place two mini M&M’s eyes about 1/3 of the way down from the top of the cookie. Repeat with remaining cookie suckers. Melt more white chocolate as needed to coat all of the suckers. Place remaining melted chocolate into a large zip-top plastic bag and snip off a small corner. Pipe “mummy wrapping” over the suckers in a random pattern. Allow cookie pops to set completely before wrapping. Munchy crunchy yummy caramel corn! 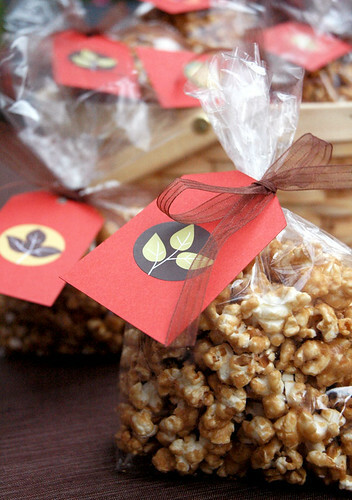 Now who doesn’t love caramel corn, especially this time of year? This caramel corn is super easy to make and it is oh so delicious! It has just the right amount of caramel and crunch, it is just perfect. I packaged it up to take with us this weekend on our annual family campout. I can’t wait to share this yummy treat with everyone! The caramel sauce does require one particular ingredient that I am not a big fan of, the dreaded corn syrup. I went on a search for a substitute and though there are pleanty of substitutes for corn syrup as a sweetener, there really aren’t many ways around it when making candy. I found a recipe that does not use any, but I was afraid that the caramel just wouldn’t set up like it should (I plan to try it another time to compare though). I read this article by the well respected David Lebovitz and I felt it made a lot of sense. It is much different when you use the corn syrup in your own recipe than when you are buying the high fructose version in processed foods. The Karo brand corn syrup no longer contains high fructose corn syrup either. When at my baking class the other day, I asked the chef there and she said that they use glucose (which they buy in bulk from a baking supply store), and I used it in the batch that we made there and it didn’t taste any different from this batch that I made at home. I researched this a little bit when I got home to see if I could find it at a whole food market. It turns out that Wilton caries a glucose that you can buy to use in making gum paste, however it is still glucose from corn syrup! So when you buy light corn syrup at the store you are getting the whole syrup, the fructose and the glucose portions, and the glucose is obviously just glucose. Since it all came from corn syrup anyway and since this is candy and not something we eat that often or that much of, I felt better just sticking to the recipe. Regardless of the corn syrup, I highly recommend this tasty treat. It isn’t something anyone of us should eat that much of anyway, even though it is so hard to stop once you start! Pop popcorn using your preferred method. Place the popped popcorn in a very large bowl (or two large bowls). Make sure there is enough room in your bowls for tossing the popcorn. Preheat the oven to 250° F. Meanwhile, to make the caramel, melt the butter in a 2-quart saucepan set over medium heat. Once the butter is melted, mix in the corn syrup, brown sugar and salt. Increase the heat to medium-high and bring the mixture to a boil, stirring frequently. Once the mixture reaches a boil, let the mixture continue to boil for 5 more minutes stirring. Remove the mixture from the heat, stir in the baking soda and vanilla extract. The mixture will bubble up and become frothy. Pour the caramel sauce over the popcorn in the bowl(s) and toss to coat thoroughly. Spread the popcorn evenly onto two large baking sheets lined with parchment paper. Bake for 50-60 minutes, removing from the oven to toss/stir every 10 minutes. After 50 minutes, test a cooled piece of popcorn. If it is not completely crispy, then bake for 10 more minutes.